Today's blog is brought to you by the letter 'N' Moving through the rainbow in a predictable Western sort of way (almost google-ish? 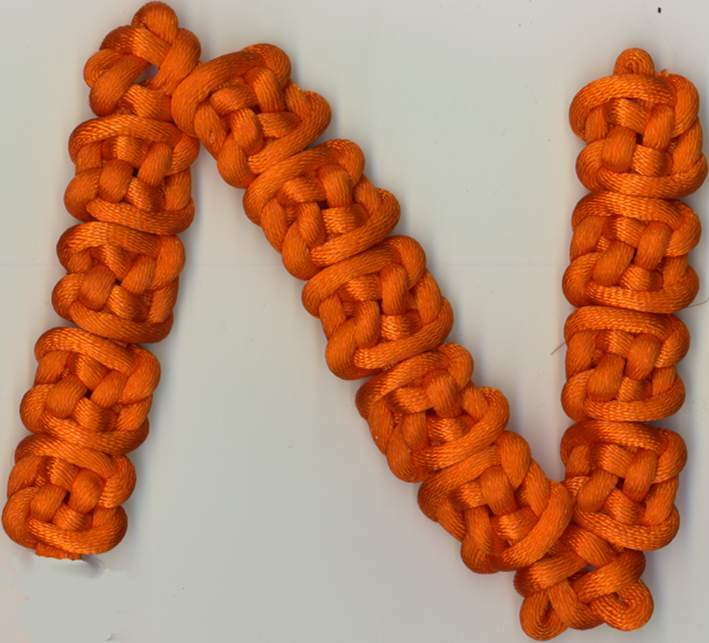 8) the letter 'N' is orange. I wanted each knot to be from a different knot family as well, and for the nicely straight parts of the 'N', the plafond seemed like a good choice. For the corners, something with more built in flexibility would be needed. 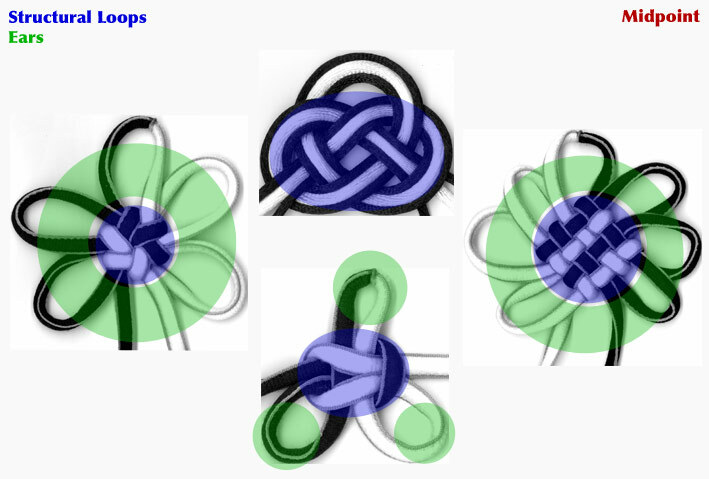 When I look at the centre of the plafond knot, what I see is the centre of the sauvastika knot. Perhaps this follows logically from the fact that both are built out of interlinked simple overhand knots, but maybe not. 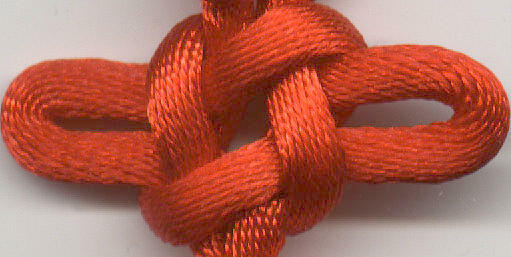 pull each set of ends (usually one set at the top and one set at the bottom) through the knot carefully, so as to not lose the structure of the knot, until they end at the desired place. Usually at a different ear location. The structure itself can be fiddled with, but it's tricky. The sauvastika is not the most structurally sound of knots to begin with and when the ears are shortened to nubs, it would be prone to spontaneous self-disassembly if it were not reinforced with thread. I suspect that the plafond knot, on the other hand, would never untie itself even if you used rayon or some other slick and slippery synthetic cord, but maybe I just tension things too tightly. Reinforcing the structure of knots with thread is a little tricky, at least with satin cord, since the core of the cord is so dense, pushing the needle through can warp your carefully tightened knot. Hiding the thread on the other hand is relatively easy due to the forgiving nature of the surface of the cord. I'm still looking for the perfect needle to do this with however. I like milliners needles because they are long with a small eye so that they also work well with beads and they are strong enough to go through the cords, but it'd be nice if the eyes were longer as some of the places I work are quite dark and sometimes I feel like I'm threading blind. I need to put needle threaders into my carry-everywhere kits... I should probably also try to find sharp but less delicate beading needles.